I know I do. Sometimes I wonder how I survived Mondays before I made this delicious gravy. Yes, lots of cups of coffee, the occasional Scotch taping of the eyeballs, and a baker’s dozen of Voodoo Doughnuts do help, but this gravy is everything. The beautiful thing about this pimento cheese gravy is you can put it on anything. Or, if you are addicted, like yours truly, just stand over the stove and shovel it from the saucepan to your mouth. You’ll find no judgement here. But! If you are feeling a little more mild-mannered and would like to present this gravy in a more decorative party vehicle, then I recommend pouring it over some skillet biscuits and topping it with everything under the Sabra sun. Oh yes! 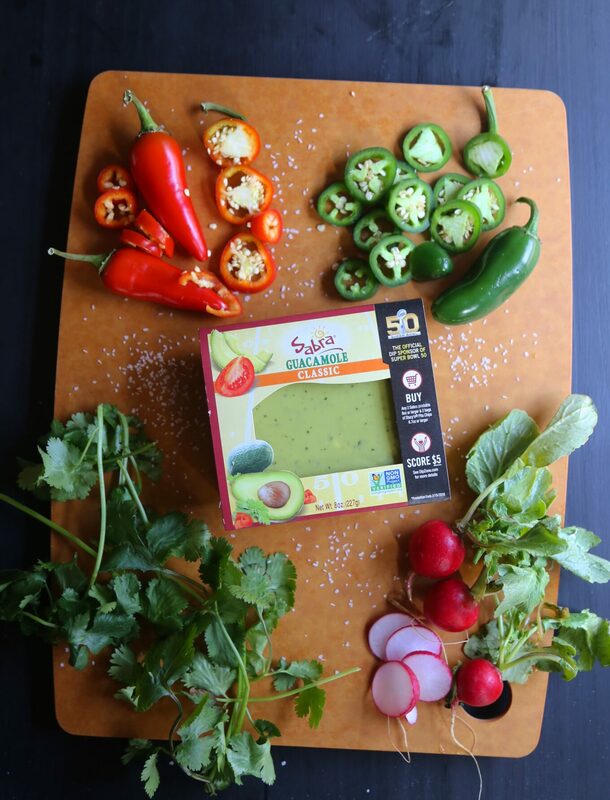 In case you didn’t know, Sabra makes more than just hummus. They have the best guacamole, fresh pico de gallo, and Greek yogurt toppings that will make any game day spread an 11/10 situation. 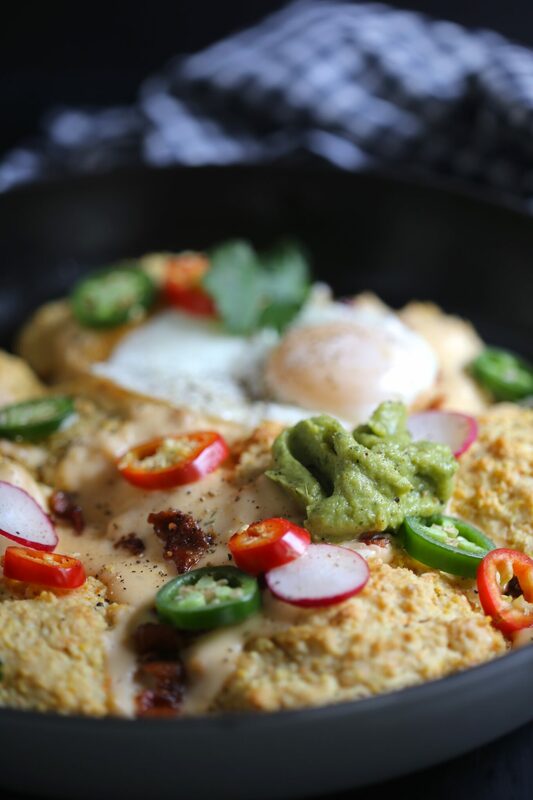 I dolloped some of their classic guacamole on top of these Loaded Skillet Biscuits with Bacon & Pimento Cheese Gravy and I can’t even begin to describe the taste. 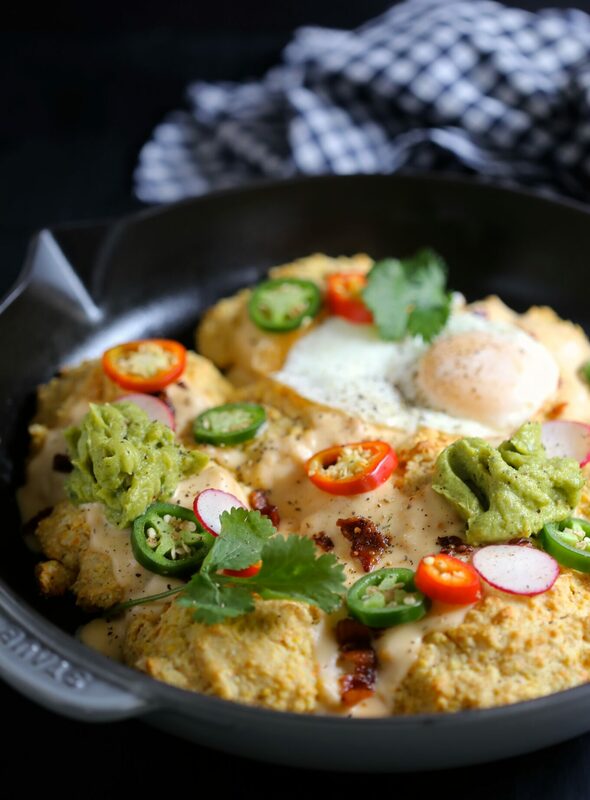 Cheese, bacon, and guacamole are three amigos when it comes to watching football, and when thrown together on some fluffy biscuits, it’s like scoring the game wining-touchdown. Can someone just pass me the saucepan, please? Preheat your oven to 425 degrees. In a food processor, add the flour, cornmeal, sugar, baking powder, baking soda, salt, and pepper. Pulse a few times to combine. Next, add the butter and pulse until you get pea sized dough. Add the buttermilk and pulse until combined. Spray a 10-inch cast iron skillet with non-stick cooking spray for extra insurance. Ladle about 1/4 cup of biscuit batter into the skillet. Making sure the biscuits are at least an inch apart so they can bake properly. 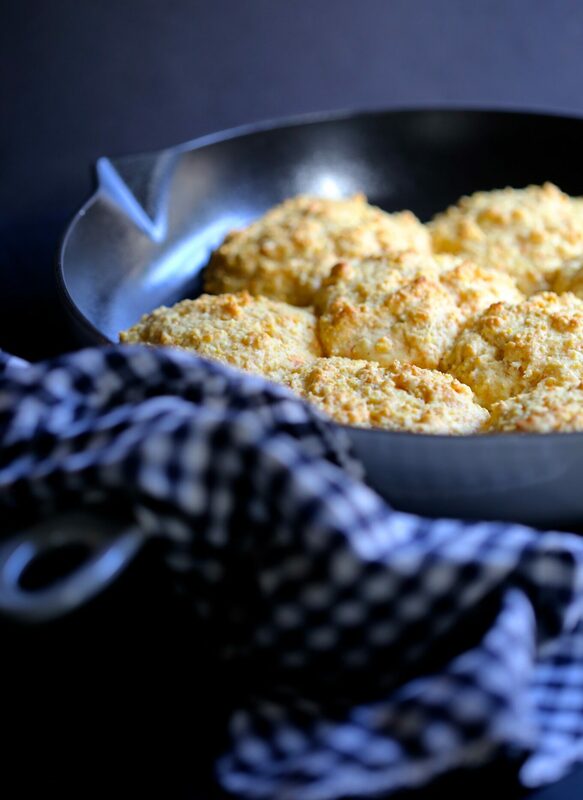 You should be able to get about 8 to 9 biscuits into the skillet. Bake biscuits for about 12 to 14 minutes, or until golden brown. 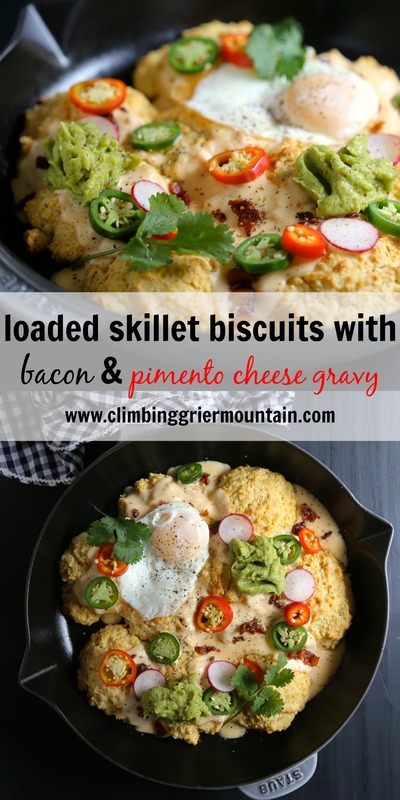 Remove from oven and pour pimento cheese gravy on top of the warm biscuits. 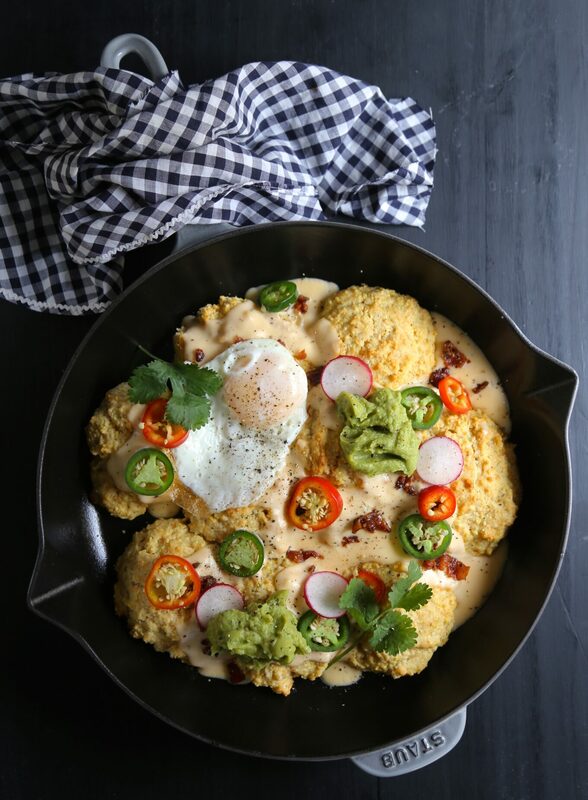 Garnish with bacon, Sabra guacamole, jalapenos, Serrano peppers, cilantro, and a fried egg! Serve immediately. In a medium saucepan preheated to medium heat, melt the butter. Add the flour and whisk continually creating a roux. Next, pour in the whole milk and stir until thickened about three minutes. Remove from heat and stir in the pimento cheese. Add salt and pepper if desired.